At the end of the day it's brilliant to be able to go home, shut the door and relax. Home is where you are safe. Home is where you are sure of a welcome. Home is the place, as the poet said, where if you have to go there they have to let you in. But what if that isn't the case. What if home suddenly becomes a place of danger - somewhere that isn't welcoming - what if the door is shut in your face? That is the situation faced by hundreds of LGBTQ teens when they pluck up the courage to come out to their parents. Some are lucky and are taken in by friends or other family members but some are left homeless and have to go into the care system or onto the streets, with all the dangers that implies. This is where the Albert Kennedy Trust comes in. The following is reproduced with permission of the organisation. To ensure that all lesbian, gay, bisexual and trans young people are able to live in accepting, supportive and caring homes, by providing a range of services to meet the individual needs of those who would otherwise be homeless or living in a hostile environment. • Providing appropriate homes through supported lodgings, fostering and other specialist housing schemes. • Enabling young people to manage independent living successfully. • Improving attitudes within society towards lesbian, gay and bisexual young people. • Delivering flexible and responsive services centred on the needs of LGBT young people. • Engaging, supporting and nurturing LGBT young people. • Providing accessible, safe and positive environments that are respectful of difference and diversity. • Pioneering and innovative services to meet real need. • Good communication and participation throughout the organisation and valuing and encouraging the contributions of all those involved. Excellence and best practice. • Working in an open and honest manner, where trust is earned and given. • Working as a team.Challenging perception both internally and externally. And doing the above with passion, energy and enthusiasm. I think they are doing a grand and important job - one really worth supporting. They have suggestions on their website, which I hope you will visit. Since this blog hop requires a giveaway, I'm offering a copy of Alike As Two Bees to one commenter, but I will also make a donation to AKT on his or her behalf. Thanks for reading and enjoy the Hop. Oh please do. It's a very inspiring charity doing something very practical. Great post, Elin - on behalf of a fantastic charity. Thanks JL. they are good folks, aren't they! That's a brilliant organisation - very well done to them, and thank you for drawing it to our attention! Thanks for dropping by, Anne. AKT is really doing good work. VEry true, Kimberly. Thanks for commenting. I never heard of that group - that is outstanding! I've known too many young people who end up on the streets. On the streets is an awful place to be. Thanks for commenting, Sue. Thanks for introducing me to this wonderful organization. I cannot understand how families can be so cruel. AKT are the bizz :) thanks for commenting. I've never heard of The Albert Kennedy Trust until this post. It sounds like a great organization, thanks for bringing attention to it. Every country needs it's own version of AKT. :) Thanks for dropping by. Thank you for being part of this HOP and helping shine a light on this important issue. I visited the site you posted; seems like a great organization! Something I'll never understand is how, if you are lucky enough to have children, you could ever, EVER, toss them aside. Just can't fathom it! Many thanks for replying to my post, Maya, and with such a pertinent comment too. No, I don't understand such parents either. They must live in a very strange harsh and horrible world. Thanks for commenting, Foretta. I hope you have enjoyed the Hop as much as I have. 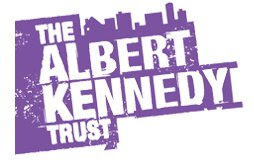 The Albert Kennedy Trust sounds like a wonderful organization. I will never understand how a parent could kick their child out just because they are gay, it's absolutely horrible. Thank you for being part of the Hop! Yes, Jen, AKT is a terrific organisation. Thanks for commenting. Education is key to stop the fear that stems from ignorance. You are placed in a perfect position to help with that. Good luck to you. Thanks for commenting. Thank you for participating in this hop and for generously donating to such a worthwhile organisation. Thanks for commenting, LM. I hope you have enjoyedf the Hop as much as I have. Thanks for participating in this great hop. I'm enjoying all the posts. Thanks for commenting, Wulf. There have been such a marvellous range of posts - some heartbreaking, but all very positive. Thanks for that. I didn't know about the Albert Kennedy Trust. Thanks for commenting Erica and HUGE thanks for organising the Hop. I hope you have enjoyed it as much as I have. I can't even imagine how horrible it would be to have your family turn against you, I'm so glad that there are people out there to help should it happen. I can't understand how anyone could do it, personally, but there you go - that's why we need AKT and similar organisations. Maybe one day we won't? thank you for commenting. I hope you have enjoyed the Hop as much as I have. Thank you for the post on such a great cause. Thanks for posting, Peggy. I hope you enjoyed the Hop as much as I did.